Experience one of the world's premiere nature and wildlife destinations with an 10 day custom trip to mainland Ecuador & the Galapagos! The “Enchanted Islands” as the world calls it, is a place of dreams, of dark stories, of pirates, incredible wildlife and prehistoric landscapes, inspiring a range of emotions you can only experience by visiting them. On your trip, you will encounter the exotic wildlife in their natural habitat, investigate the wonders of the underwater world and discover nature at it's finest. After your expedition in the Galapagos, you will travel across the Andes today to explore the cultural side of mainland Ecuador while spending time in the idyllic countryside at Hacienda Zuleta. This is your chance to be captivated, as you get lost in the wildlife, relish in the scenic beauty and enjoy time as a family! Welcome to Ecuador! Upon arrival at the airport in Quito, you will be greeted by our local representative, who will transfer you directly to the Wyndham Hotel, conveniently located right near the airport. This will make for an easy and comfortable start to your adventure. Check into your room and enjoy the rest of the day free at your leisure to get settled and relax after your long travels. After breakfast at your hotel this morning, you will make your way back to the nearby Quito airport, to board your two hour domestic flight to Baltra, for your Galapagos Adventure! Welcome to the Galapagos! Upon arrival at the Baltra Island Airport, you will be greeted by a local representative who take you to your awaiting vessel, The Ocean Spray luxury catamaran. There, you will enjoy a welcome introductory briefing and delicious lunch, before setting sail to Bartolomé Island, a lunar-like island with the basaltic cone of Pinnacle Rock at one end. 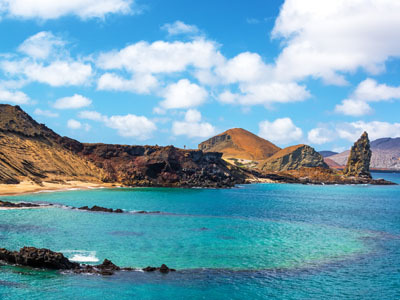 The island consists of an extinct volcano with a variety of red, orange, black and even green volcanic formations. A trail of stairs leads to the summit of the volcano, boasting one of the best views of the island. After a hiking to the viewpoint, you could find yourself snorkeling, or, if you prefer, exploring the beaches. Keep an eye out for Galapagos penguins, which have been sighted here! Indulge in a welcome cocktail back on the boat, before reviewing your expedition plan for tomorrow and sitting down to dinner. Enjoy your first evening on the ship, being rocked to sleep. This morning after breakfast, the ship will have reached Genovesa Island. Formed from a shield volcano, it's now home to thousands of birds. After disembarking, you'll take an easy walk through Darwin Bay. This white-sand coral beach heads a half mile trail (.75km) that winds through mangroves filled with land birds. Nazca Boobies, Red-footed Boobies, and Swallow-tailed Gulls can be spotted here. Further down the path are tidal pools where sea lions swim playfully. At the end is a spectacular view off a cliff. After leaving Darwin Bay, you can enjoy more time for swimming or snorkeling before venturing to El Barranco for a more strenuous walk. Also known as Prince Phillip's Steps, El Barranco’s steep, rocky paths leads up to a high cliff-face. A marvelous view can be appreciated from here. This site is also home to Palo Santo vegetation as well as Red-footed Boobies, Short-eared Lava Owls, Galapagos Swallows, and Galapagos Doves. This morning after breakfast, the ship will have reached Santiago Island. Here, you will explore the coastline along the impressive cliffs of Buccaneer Cove. The cove is home to a large number of marine birds, sea lions, and intertidal organisms. You will get to admire fantastic natural formations such as the "Elephant Rock", "The Bishop" and an impressive natural cave. The Espumilla Beach is also a popular place for marine iguanas and Sally Lightfoot Crabs. The crabs attract the hunting herons, performing the dance of predator and prey. 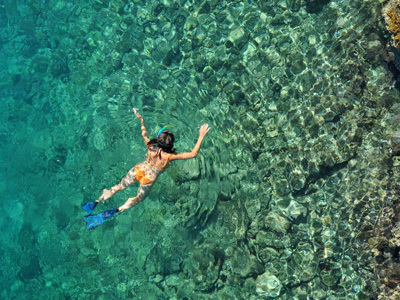 With an abundance of marine life including octopi, moray eel, and shark, snorkeling is highly recommended. This morning you will set sail to North Seymour Island, making the most of your time left on the catamaran! The island was formed by a series of submarine lavas containing layers of sediment that were uplifted by tectonic activity and characterized by its arid vegetation zone. The former seabed of the uplifted tabletop of North Seymour Island is strewn with boulders and overgrown by dry shrubs. Nevertheless, this islet is one of the most visited sites, and overloaded with bird life. Follow an easy circular path that takes you through the archipelago’s most extensive colonies of blue-footed boobies and frigate birds. This is one of the few spots where you can compare the magnificent and the rarer great frigatebird breeding next to each other. 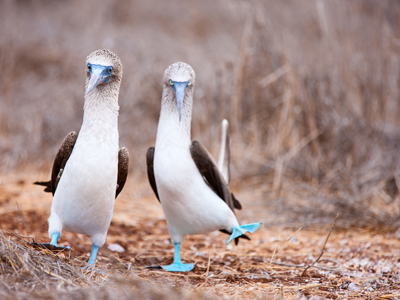 The popular blue-footed boobies show their cute courtship rituals, in which their remarkable feet play an important role. You will likely spot several other seabirds, such as brown pelicans, red-billed tropic birds, endemic swallow-tailed gulls and seasonally even Nazca boobies. Between the shrubs, you might also catch a Galapagos land iguana. Board the boat again for some delicious snacks and time to relax. You will ride towards Santa Cruz highlands, which you will reach by bus from Puerto Ayora. Journeying across Santa Cruz into the highlands, you will be delighted by the island's variety of life and geology. Beginning at the coast and traveling across Santa Cruz, the road departs from Puerto Ayora climbing through the agricultural lands and into the mist covered forests. Santa Cruz possesses all of the various life zones present in the archipelago. As you travel through these zones bird watchers are enchanted. Whether it's the bright red feathers of a vermillion flycatcher or one of Darwin's Finches, almost every bird present in the islands can be found here. Santa Cruz offers excellent opportunities for viewing wild Galapagos Tortoises. Tracking tortoises is not the only exciting activity to be found in the highlands. There are also plenty of lava tubes, sinkholes and craters to explore. Theses eerie formations offer a fascinating hike into the belly of the island to view its volcanic make-up. An early morning wake up call and snack will kick off your final adventure at sea to Mosquera Islet. This reef of rocks and coral (the result of an uprising) is only 160 meters across at its narrowest width. Though close neighbors, Mosquera and North Seymour offer a very different experience. Mosquera stands out by one of the largest concentrations of Galapagos sea lions in the entire archipelago. It’s also one of the few spots inside the National Park, where you can stroll around freely, without being restricted to a trail. Galapagos sea lions are real beach lovers and Mosquera offers beautiful white coral sand beaches, contrasting with the azure colored water. This islet is just a few meters higher than a sandbank and doesn’t complicate their landing. They love to be able to use a relaxed and easy roll, right into the surf. After exploring the islet, you will disembark the yacht and continue to the Galapagos Safari Camp, nestled in the wild highlands of Santa Cruz Island. The camp immersed in nature will provide a different perspective of the Enchanted Islands. Remainder of the day at leisure. Galapagos Safari Camp is a 55-hectare farm in the highlands of Santa Cruz Island bordering the national park, 30 minutes from the sea. The farm is rich in birdlife with finches, warblers, mockingbirds, Galapagos doves, egrets and owls — tortoises also make frequent visits. The camp is a perfect base from which to explore the islands, inland walks and horse trekking can all be organized. 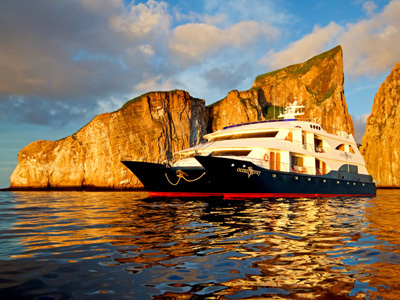 It offers a fun and flexible extension after a Galapagos cruise. Today, you can visit Cerro Mesa or Tortuga Bay. If you choose Cerro Mesa, a morning drive takes you to the eastern part of the island. At 490m above sea level, Cerro Mesa Reserve offers spectacular views of the largest crater on Santa Cruz Island, exotic plants, and seven unique subspecies of finch and the elusive vermilion flycatcher. 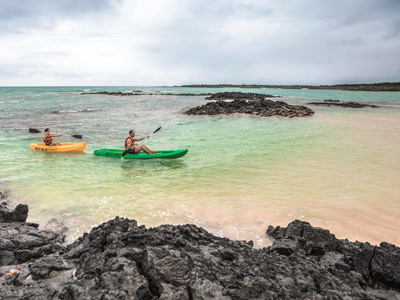 After lunch explore Garrapatero Beach, with stunning contrasts of mangroves, black lava, white sand, and turquoise water — including a flamingo lagoon. Kayaking and mountain biking are optional. In contrast, Tortuga Bay is a white sandy beach with basking marine iguanas, and shallow turquoise waters teeming with white-tip reef sharks and fish. We've arranged surf lessons for the kids here. 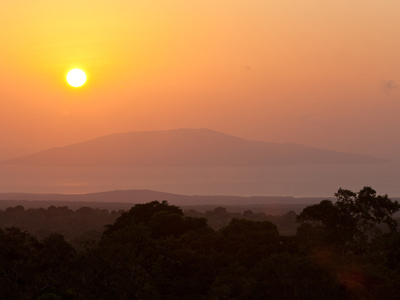 Enjoy the serenity that Galapagos Safari Camp has to offer as you savor waking up to the stunning views. Relax, walk, or enjoy the sunrise from the observatory before enjoying a hearty breakfast at the camp. After breakfast, you will return to town and transfer to the airport for your departure flight back to the mainland. 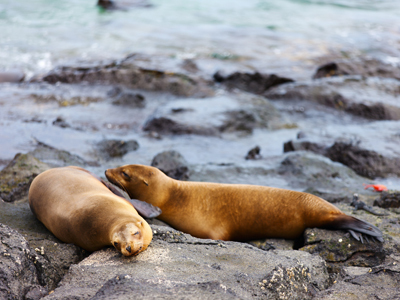 We hope you had a truly unforgettable experience in the Galapagos! 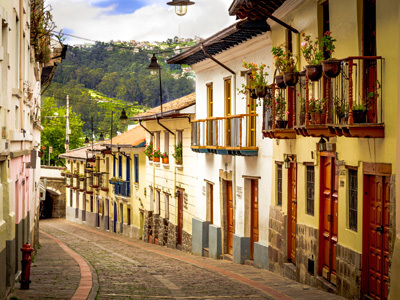 Upon landing in Quito, you will be greeted at the airport by your driver for an exploration of mainland Ecuador. From Ecuador's capital city of Quito, the journey to Hacienda Zuleta is approximately 2 hours, as you drive through lush pastureland and scenic landscapes. With some luck, you may even be able to admire views of the snow-capped volcano Cayambe on your way, which is just a few miles away from Zuleta. To visit Hacienda Zuleta is to experience four centuries of Ecuadorian life steeped in pre-Colombian, Spanish and Ecuadorian traditions. This exclusive property is open to only a limited number of visitors each year in order to retain intimacy, warmth and sincerity, reminiscent of a bygone age. When you reach the accommodation, get settled into your room and enjoy the rest of the evening as you please. Miles of meandering trails through lush pastureland, pine trees and a eucalyptus forest make the valley of Zuleta a paradise for outdoor activities, such as hiking and trekking in Ecuador. 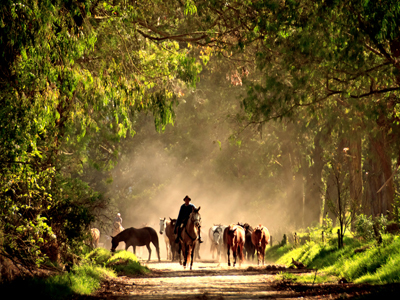 Zuleta has twenty Zuleteño bred horses, mountain bikes and a horse drawn carriage upon which you can explore the area. The Zuleteño horse is a unique combination of Andalusian, English, and Quarter horses; the outcome of this cross-breeding is a robust, noble, and smooth Andean horse with a perfect disposition for trail riding. Discover the Condor-Huasi route along grassy trails, with ancient pyramids along the way; visit the condor project, which is dedicated to the rehabilitation of the majestic Andean Condor; or explore the hacienda by horse-drawn carriage. At Zuleta, a 4,000-acre working hacienda with general agriculture, forestation and dairy farming operations. The remainder of the day is free to relax or visit the beautiful grounds. After an exquisite breakfast, you will have the opportunity to start the day with a two hour hike to the hacienda’s condor reintroduction project. This is located 3 km from the guesthouse, and nestled in a gorgeous native forest valley. 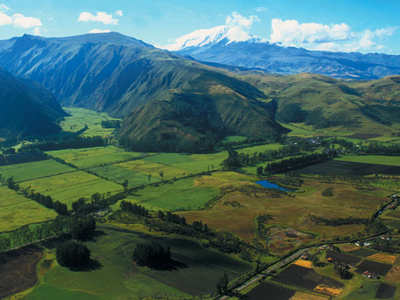 During the hike, you will stop along the way to admire some historical pre-Inca mounds. At the project location, you will have the chance to learn about the foundation’s efforts and even get to see the rescued Andean condors in the aviary, yourself. The remainder of the day is left for you to finish exploring. Enjoy a visit to the cheese factory and embroidery workshop to gain an understanding of the local work and traditions of the area. Learn about Hacienda Zuleta's semi-aged, handmade Ecuadorian cheeses and how the process has changed throughout history. After your exploration, the rest of the day will be free to relax or visit the beautiful grounds of the hacienda, before it is time for your transfer back to Quito. We hope you had an incredible family trip together in Ecuador and we wish you safe and pleasant travels onward! As you search for newly built hotels in Quito, Ecuador there are two main considerations- convenience and amenities. 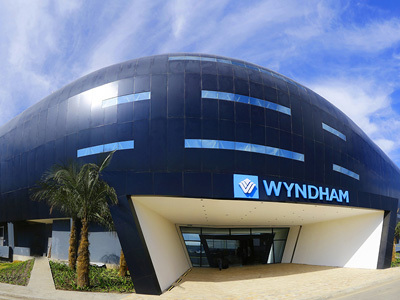 Wyndham Quito Airport hotel is onsite at Mariscal Sucre International Airport, making it a prime location for anyone flying into the area. With outstanding services and amenities which include a well-equipped fitness center, polished business center, onsite restaurant and bar, and rooms with complimentary high-speed WiFi, 51-inch flat-screen TV, digital safe and iPod docking station. Special extras such as an onsite spa and room service make it easy for you to ease into an immensely refreshing vacation. The new Mega-Catamaran Ocean Spray is a superb option for those seeking comfort and excellent service while enjoying a genuine experience of the Galapagos Islands. 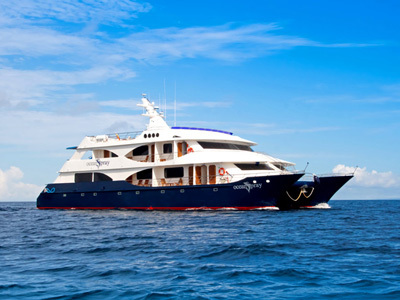 The elegant design includes a huge sundeck, Jacuzzi and spacious cabins each with private balcony. The luxury vessel, accommodates just 16 passengers, meaning the experience is intimate and personalized. In terms of communal facilities, offers its guests a jacuzzi, spacious sundeck and kayaks for use. With speed, comfort and top guides will make Ocean Spray the perfect choice for your Galapagos cruise. Inspired by the stylish tented safari camps of Africa, but located roughly 620 miles from the coast of Ecuador, the Galapagos Safari Camp is perched in the wild highlands of Santa Cruz Island, with stunning views of the Pacific Ocean and Galapagos National Park. Giant tortoises roam freely beneath the raised tent platforms and a variety of native birds, including Darwin's famous finches, flock in the surrounding canopy of endemic trees. The camp is family-owned by Stephanie and Michael Mesdag, who have raised their children in the camp and welcome guests of all ages. A stay at the Galapagos Safari Camp is fully customized and flexible. Embrace all that the island has to offer, right at your fingertips.